Not all snails and slugs are pests, so if they’re not eating your plants, you don’t need to get rid of them in your organic garden. Slugs and snails are closely related. The main difference is that snails have a shell, while slugs don’t. Most molluscs live in the water, but slugs and snails are the two that can live on land as well. In fact, there’s your most important clue right there for how to get rid of slugs and snails in the garden – they like it wet. So if they’re a problem in your area, try to locate the garden in the sunniest, driest spot, and don’t overwater or use other gardening practices that keep the soil too moist. Watering in the morning instead of the evening can sometimes make a big difference when it comes to slug and snail control. But then ideally, we want the garden to be relatively moist for the health of the plants and the soil food web, so a strategy that can sometimes work for getting rid of snails and slugs is to make sure there’s a very dry area around the perimeter of the garden. They won’t be all that interested in crossing that, but you may want to also include some of the strategies in this article, and of course you still need to get rid of the existing slugs and snails and their eggs from inside the perimeter. Of course, if you live in a wet area, you don’t have much of a chance of keeping your garden dry, so you’ll have to go right to these other options. Water. In case you skipped the intro above, go back and read it – that’s the most important step. In summary: if possible, keep your garden on the dry side. Wildlife. There are many animals that eat slugs and snails, so invite them into the garden by providing them with various sources of water, food and habitat. Frogs, toads, snakes, birds, lizards, hedgehogs and ground beetles are examples of slug eaters. If you keep a cover crop of a legume or grass or both, you’ll provide safety for those ground beetles – unfortunately, you’ll provide safety for the snails and slugs too, so it’s a bit of a compromise. Pets. If you don’t have enough wildlife around, ducks are the best at getting rid of slugs and snails, and chickens are okay, so they’ll take care of your visitors for you – but each of these birds may eat certain plants, so you need to learn how to manage them properly. Perennials. Grow more perennial plants, which often have bigger branches and root systems than annuals so they have the jump on slugs and snails in the spring. That includes fruit trees and shrubs, herbs, perennial greens and others. A few of them still may need protection, but they’ll often be stronger than plants that have just come up from seed. Transplants. If you still want to grow annuals such as tomatoes and most vegetables, start your plants inside first (or buy them) and grow them to a few inches tall before planting. That can give them a head start on the predators. Remove the mulch. If you keep a nice, thick mulch of leaves or some other organic material for all of the benefits it brings, you may want to rake that away from the beds in spring to remove the moist habitat that snails and slugs love. Of course, many beneficial insects love it too, and it’s great for smothering weeds and so on, so removing it is a compromise, but if slugs or snails are winning the battle, it may make sense to remove it. Leave it in a pile and bring it back when the rain decreases and the sun increases. Compost. Keep it away from the garden. Slugs and snails like compost a lot, too. Strategize with the mulch. Rake the mulch into a long row beside the garden, compacting it to give a perfect place for snails and slugs to lay their eggs. Then, on an occasional sunny day, move the row over a couple of feet to expose the eggs to the sun, which will kill them. Here’s how permaculturist Sepp Holzer does it (from his book Sepp Holzer’s Permaculture): Slugs and snails lay their eggs in dark, moist places. If you provide them with an ideal habitat to lay their eggs, you can regulate their population. To do this I make rows of freshly cut grass and leaves in the garden. They should be piled higher and compacted more than mulch, and should be kept as moist as possible, so that they provide the best conditions for egg laying. Slugs and snails will travel great distances to use places like these. On a particularly sunny day I then go into the garden and turn over the rows of grass with a gardening fork. Whole clusters of eggs will have adhered to the rotting grass. If you turn the rows of grass over at midday when it is at its sunniest, the eggs will rapidly be destroyed by the heat of the sun and the UV rays. Seaweed. Speaking of mulch, when I lived on the west coast, fresh seaweed worked well to keep slugs away from the garden, partially because of the salt, but also because when it dried out, the roughness was difficult for the slugs to navigate over. I imagine the roughness depends on the type of seaweed. Effective Microorganisms (EM). I don’t imagine this will always work, but in one garden I used to maintain, I sprayed effective microorganisms and it dissuaded the slugs from eating. I left a corner of the garden unsprayed and they still ate plants in that corner. I’m not sure if the EM just improved plant health to the point that slugs didn’t find the plants attractive, but it was very cool – I still saw the slugs around, but they didn’t eat as much. Nematodes. Many people have heard of spraying nematodes on the soil to control grubs. Turns out there’s another species of nematodes that can control slugs: Phasmarhabditis hermaphrodita. I haven’t seen them available for purchase in North America as of this writing, but maybe some day. Yucca. I bought some yucca extract once because I was considering selling it as a compost tea ingredient and spreader/sticker for foliar fertilizing. It turns out that mixing it 50:50 with water deters slugs and snails from eating. Just like with the EM, they’re still there, but they don’t cause near as much destruction. Neem oil. Some people have had success using neem oil on plants to deter slugs and snails, but it doesn’t appear to be the most effective option. I’ve seen it work on other slug-like insects such as pear slugs, but those aren’t true slugs. There are many things you can put on the soil. Other than the first one in this list, they have to be refreshed regularly. Boards and other hiding spots. As mentioned up above in the mulch section, during the day, slugs and snails hide in damp, dark places at or just below soil level. If you place some wooden boards such as 2×6’s on your soil, the molluscs will hide there. Go out every day, lift the boards, and do whatever you want with the them. Minerals. Some people sprinkle specific ingredients such as epsom salts (magnesium and sulfur) or salt, which can help get rid of snails and slugs, but it can also cause soil imbalances, so I would only use these if I knew my soil needed, in this example, magnesium and sulfur or salt. Diatomaceous earth (DE). This is the fossilized remains of a type of algae called a diatom. It’s like a rock that’s made into what feels like a powder to us, but actually has microscopic sharp edges that cut the slugs and snails. You sprinkle it on the soil and it kills by dehydrating insects from the outside when it gets on their body, or from the inside when they breathe it in. Unfortunately, it kills many beneficials too, so use this with care. I actually stay away from it for this reason, but some gardeners love it. And be sure to buy a horticultural product that doesn’t have chemicals added – some people even opt for a food grade product, but that can get expensive. Wood ash. Wood ash is a source of calcium and potassium for your soil, which is great unless of course your soil already has enough calcium or potassium, in which case you don’t want to add much more of it. But a narrow row of dry wood ash sprinkled around plants or around the perimeter of the garden can deter slugs and snails because it desiccates them (draws water out of them). Of course it does the same thing to plants, so be sure to keep it away from them. It also does the same to other soft-bodied insects, so use it sparingly. Sawdust, lime, sand, etc. Like the wood ash above, there are several other inputs that snails and slugs don’t like to crawl across because it draws water out of them. Sepp Holzer uses sawdust mixed with wood ash and/or lime. Again from his book: In smaller gardens the following method is very effective in my experience: take a watering can, cut the spout to half its original length so that it is much wider. Fill the watering can with a mixture of very dry fine sawdust, ideally collected from a carpenter or joiner’s workshop. The sawdust must, of course, come from untreated natural wood and not be varnished or contain any other harmful substances. I take the sawdust from a carpenter’s workshop, because the wood there is completely dry and the sawdust is much finer than you would find in a sawmill. Moreover, sawmills mostly work with fresh wood. I mix the sawdust with one part wood ash to ten parts sawdust, or with quicklime powder (around 1:20). Alternatively, you could use both, the only important thing is that all of the ingredients are bone dry. I fill the watering can with these materials and pour a finger’s width border of the mixture around the outside of the lettuce or vegetable patch. Make sure to free the border area of vegetation first. This border of sawdust mixture should remain as dry as possible. This means that from time to time, especially after is has rained, you will have to replace it. The fine dry sawdust mixture adheres to the foot of a slug or snail the moment it tries to get to the lettuce or vegetable patch. The ash and quicklime extract moisture, which prevents them from getting into the crop. If you sit in the garden in the evening, you will be able to see how the slugs and snails turn around when they reach this barrier and go back the way they came. Successes like these will quickly take the fear out of a slug or snail invasion. Corn meal or bran. Slugs and snails love corn meal, but unfortunately for them, it also kills them. Put some in a jar and lay the jar on its side so the molluscs can get in. They’ll eat some, leave, and die. This works okay with bran too. Egg shells. Some people have success with this, but it often doesn’t work. Besides, do you have enough egg shells to protect your whole garden? Coffee. Fresh coffee grounds, used coffee grounds, cold coffee – all of these have worked for some people, but don’t work very well for most people. I haven’t found any controlled studies where it worked particularly well either. Apparently, it’s the caffeine that causes problems for the snails and slugs. Perhaps the concentration is what’s important, i.e. maybe most people weren’t using enough. If you have access to a lot of fresh grounds, and if your soil is low in nitrogen, you can try it – but it’s definitely not the most effective method in this list. Other foods. Instead of laying down wooden boards, some people use cabbage leaves, citrus fruit peels or overturned half melons to lure slugs and snails. This makes sense for very small gardens. These traps work well, but you need to have them fairly regularly throughout the garden, and they need to be replenished often, so they make the most sense in small gardens. Beer. This is a common strategy for how to get rid of snails and slugs and it works well. Beer attracts them, so put some into a deep plastic container and bury it in the soil so the top comes up about halfway above the soil (at that height, the slugs will crawl in and die, but many beneficial insects won’t). It’s kind of gross, but it works. Unfortunately, it may still attract some beneficials, too, and you need a trap every 10 square feet or so, so it’s most feasible in a small garden. Homemade. It’s the yeast that attracts them in beer, so instead of precious beer, you can use a mixture of 1 tsp flour, 1 tsp brewer’s/instant yeast, 1 tsp sugar or honey and 1 cup warm water. The measurements don’t actually matter too much. Some people put 1 tsp of salt in, too. Nettle tea. Are you lucky/unlucky enough to have nettle on your property? Although it stings like crazy when you touch it, I’d love to have a ‘nettle problem’ in my yard. It’s a highly medicinal plant for humans and for the garden. And if you put some nettle in water just like we did with the beer above, slugs and snails will gravitate to it like me to chocolate cake. Copper. Copper wire/tape/mesh can work well to keep snails and slugs out of the garden. It’s quite expensive, but compared to a lot of these solutions, it lasts a long time. The copper reacts with the slugs’ mucus and gives them what feels like an electric shock. You can wrap it around tree trunks or around the sides of raised beds. Just be sure to get a wide enough strip to really deter them, which could be 4-6” depending on how big the slugs are where you live, or just use multiple strips side-by-side if all you can find is 2” tape. It’s more affordable to get a copper roll at a hardware store rather than buying a product specifically branded for slugs and snails. Sandpaper. It doesn’t give them a shock like the copper, but is difficult for them to climb over. Lava rock or gravel. These can be difficult for them to crawl over, too, so you can make a perimeter around the garden of coarse lava rock or gravel. Test in a small area first to make sure it works for your particular trespassers, as this is obviously a more time-consuming, costly option. Tilling. Thoroughly rototilling the ground in early spring when it starts to get warm will kill many slugs, snails and their eggs, but it also kills earthworms and other beneficials, along with exposing your organic matter to oxidize more quickly, and other downsides, so while tilling can be occasionally useful, I wouldn’t use it only for slug control. Metaldehyde. This is what most slug and snail bait used to be made of. It’s quite poisonous stuff, no longer recommended. Iron phosphate. These days, the goto is iron phosphate, which kills slugs and snails, but is not so bad for us. It’s marketed as being very safe, but some dogs have been poisoned, whether by the iron phosphate or the ‘inert ingredients’ I’m not sure, so I would keep it away from pets and children. I wouldn’t sprinkle it all over the whole garden, but I would put some down in strategic places and protect it from rain with a wooden board or something similar. Sluggo is a popular brand that’s now OMRI-Listed. Sluggo Plus contains Spinosad, harmful to many beneficials, so I wouldn’t use it unless you have a specific reason. Sodium Ferric EDTA. This is the newer alternative to iron phosphate. Unfortunately, the EDTA is very toxic, perhaps even more so than metaldehyde, so I stay away from this one. An example of this is Safer Brand’s “Dr. T’s Slug & Snail Killer.” I’ve read that some iron phosphate products contain EDTA, so if you use one, be sure to find one that is OMRI-Listed or otherwise certified by an organic agency. Ammonia. Mix with 4 parts water (1/4 cup of ammonia per cup of water) or according to Linda in the comments below, 20 parts water is fine (slightly less than 1 Tbsp per cup of water). You can spray this on snails and slugs to kill them directly. It’s caustic stuff, so just a small spray is needed. Don’t get it on yourself. Phew, that was a long one! Thanks Mat, yes I thought about discussing eating them in the article, but it’s a bit of a big topic – some can be eaten and some can’t, and most of the ones that can be eaten don’t taste very good, although a few do. Would be an interesting article for sure. There is a gardener here in Austin that puts out a box of corn meal to feed them so they get big & plump and sells the to restaurants. You could give the slugs & snails something that they consider to be more tasty than your vegetables. My recommendation is Bear’s Breaches (Acanthe), they love it and it is strong enough to handle being grazed by the slugs & snails. Twice per week pick them off and give them to the chickens. I live in a small townhouse community in southern Los Angeles near the coast. When I first moved here we had a terrible snail problem. They were everywhere in this complex! There were no squirrels, which I thought was strange. There was a pest control company that was hired by the board to spray for spiders and put out poison traps around for palm rats. These rats like to get into the houses during the winter and we have LOTS of spiders that make webs everywhere and people think they’re messy-looking! I never let them spray around my unit. Eventually I was elected to the board and was in charge of the landscaping committee. I made a lot of discoveries! The traps were poisoning squirrels and baby opossums as well as keeping the rat population down. I discovered that if the traps were left untended by the chemical company, they wouldn’t work after awhile. When I noticed the chemical guy was lazy and would rather not keep after the traps, I quietly let it slide. There are some pretty fanatical “pest” haters that live here and I wasn’t about to go head to head with them! The squirrels and opossums came back and so did the rats. I found out that if people learned to repair the outside air vents and any holes around their sink areas in the kitchen and put stripping around their garage doors, the rats won’t get in! Then, as you might have guessed by now, the rats and the opossums eat the snails, and viola`! No more snails! I did find a place in my garage where the rats had been dining on snails and found piles of empty pieces of snail shells there! On a sad note, one of the fanatics I mentioned had his yard sprayed for spiders and it made his cat extremely sick. I had a talk with him about it trying to explain about ecosystems, etc., but all he could do was irately blame the chemical company for what he called “over spraying!” Some people, unfortunately, want to keep their blinders on! Wonderful story Jeannette – thanks so much for sharing! wow. lots of great tips. we’ve had some success with beer. We had a home brew batch not turn out and that worked great. we put a small tub by each bed and we’d have to empty them a couple times per week because they’d be full. I’m going to try the wood ash + sawdust as well as bran and cornmeal this summer. it’s good to have options. Thanks! 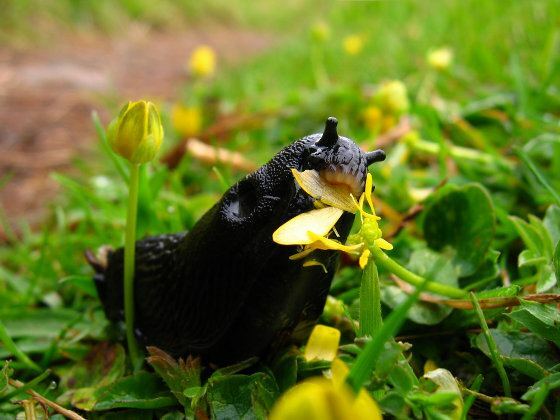 Slugs and snails in Hawaii can harbor a parasite that can cause Rat Lung Disease in humans (via ingesting slime stuck on greens or perhaps ingesting a small part of the snail/slug. The disease is serious and can sometimes be fatal to humans. I don’t like killing things, but am on a mission to get those slimey critters out of my garden. This is a rainy area so there’s no chance of drying the garden out and we can’t have ducks in this townhouse community. Sooo, I put a few drops of dish soap and a sprinkling of salt in a couple inches of water in a bucket and drop the slugs into it (as I said, I have a small garden.) When I’m smart I wear a surgeon’s glove to do it. They will not survive this, but of course they’ve got tons of family members still out there ready to slime their way over my herbs and greens. A good old fashioned approach to getting them one at a time. Thanks for sharing Carol. Hi Phil, this was a great article! I really enjoyed reading it. thanks a lot. Are you planning having a similar article for leafminers? I probably won’t do many insect-specific articles on the site, but may tackle groups of insects that can be managed with similar approaches. thanks! that could be very helpful! Thanks Marie, I hadn’t heard of oak leaves as a solution before, although I do use them often in my garden. Definitely worth a try. Another great article Phil! Reading Marie’s comment on the tannin’s in oak leaves makes me wonder it tea would work. It does have a lot of tannins. It would be worth a try to spray the leaves with it. Would be neat to do an experiment on some plants with tea and on others with coffee. Thanks for the article. It came at just the right time for me. This year I just included pine needles to my arsenal. I’m using them on my pathways and have avoided having any slugs on them. They are like slow release capsules for placing some acid in the soil. They are free for me. I find they don’t hold the water either. Sure makes for an easier pathway for small wheels to roll over too. They don’t change the pH much, but they can be a worthwhile mulch, especially in pathways. Thanks for sharing. I know that works with bigger animals, but hadn’t heard of that for slugs. Thanks! I get coffee grounds from Starbucks. I put it down once where we have had slugs and snails and the problem just went away in a matter of days. I did not put a big barrier around anything but just lightly spread it on the ground where there was a problem. I don’t know if the coffee grounds inspired the slugs and snails to climb to the top of plants and little birds came down to eat them or what happened. They are just gone. Coffee grounds does also repel squirrels. We had a terrible problem with them digging directly underneath our chicken’s feeders. I filled each hole as they were discovered and so far the squirrels are gone from that area of the yard. The chickens don’t care about the coffee so I stopped worrying about how it would affect them. We had tried all sorts of natural products to repel them but coffee is the one that has been the most effective. Glad coffee grounds worked for you. It seems to be hit or miss with them when it comes to slugs and snails, but definitely worth trying and they make a nice fertilizer anyway. Thanks John. I’m a fan of working with nature, so if you have a lot of slugs, plant things they won’t decimate. Of course that’s hard to do in a vegetable garden because they seem to like a lot of things, although a herb garden can work well with slugs. The ammonia can be diluted 1 part ammonia to 20 parts water and will work fine. Interesting about the nettles and the method from Sepp Holzer. Will do both. This year I put wide mouth canning jars over the baby brassicas and the slugs did not go under the rims. All good tips. Thanks Linda. Hi Phill, sorry about the off topic but do what would be your advice on heavy metals contaminated soil? A belated thanks for sharing James! If you have a bit of land, a small flock of domestic ducks will control the slug population, and the ducks aren’t as hard on the garden as chickens in terms of eating produce. Since we’ve had ducks, slugs are not a problem.They also eat mosquito larvae on standing pools of water. Yes, ducks are great helpers in the garden. A belated thanks Mary. Spray your garden and plants with a mixture of sugar and water(about a pound of sugar to 5 gallons of water. Spray all your plants and soil. Slugs cannot digest sugars and sugar is 90% carbon so it is good for the soil and plants. I have been using this method for five years and it not only works on slugs but also other bugs that eat my plants. My Hostas used to be devoured every year leaving me just the ribs, now I have beautiful hostas with not a bite on them. The only drawback with this is that you need to reapply after a heavy rain. Yes, sugar is a good one John. Partially it deters the slugs and some other insects, and also it often improves plant health, which in turn deters slugs and insects. Thanks for sharing. Thanks for the support Phil. I’ve been using this method for a few years now. BUT, with the price of sugar going up, perhaps it might be healthier for me to keep spraying my garden with it instead of eating.it. i mean the sugar lol. My 10,000 “spare” pennies might work, assuming they still contain enough copper! I’ll try them. thank you so much, Phil– always so informative!! Living in the UK, its always wet- ho hum–so keeping dry is never possible. I’ve done most of the things you’ve recommended and all helped…to a degree. But I’ve decided to take a season or two off of growing my veg because of them and figure out what it is about our wee ecosystem that keeps them so proliferate. …wish my cat would eat snails… Thanks again for sharing from your seeming inexhaustible fount of knowledge! I wouldn’t give up entirely – they’ll still come back in 2 years. Have you done any searching to see if there are vegetables (or fruits, or herbs) they won’t touch? There must be something. Would using limestone as mulch detere slugs. I live in michigan and new at gardening. Seems the slugs are everywhere on my lawn and flowerbed. The holes they leave on my hostas and lillys are terrible and ugly. Ive tried pestaside and salt. At a loss. Lime on its own probably won’t do much. As you can read in the article above, mixing it with sawdust may bring some relief. Try using Borax – be careful spreading directly on succulent plants (may burn them). Directly on a snail or slug – just like magic 🙂 I’m in Florida and have a lot of potted plants with trays underneath for retaining water. Snails/slugs love to live under the trays, so I put the borax underneath. Sugar with attract roaches! Especially in potted plants!